Haute Whimsy: Lily Jane Giveaway! I'm a bit of a stationary fanatic, so when I saw Lily Jane's designs, I fell oh so in love! She has note cards, greeting cards and other fun gift accessories. Not only that, but she donates 10% of her profits to March of Dimes! Lily Jane is offering a very lucky Haute Whimsy reader a choice of one stationary set, or a selection of 5 individual cards. To enter, please take a moment to visit Lily Jane and leave a comment below with what you would choose if you won. *Congratulations to our winner, Jenny! I love the thank you cards with the little pink flower/vine. I also love the bee's knees cards, so I might just have to win and purchase too! Love the shop! Love the e.e. cummings card! I like the purple and the pattern of the Vintage Patterned Stationary Set. I'd pick the E.E. Cummings cards! I would choose the Vintage Patterned stationary set. Vintage Patterned Stationery is really cute. I love the color. I like the bee's knees card, the lily of the valley thank you cards, and the vintage stationery! I like the Vintage Patterned Stationery set!! I just love the Flight Pattern Stationery Set. I really like the lilly of the valley thank you cards! I like lilly jane on facebook! I follow lilly jane on twitter! I'm a "bee's knees" fan...reminds me of the Camera Obscura song "Let's get out of this country". I like the vintage patterened stationary set. I like the Flight Pattern Stationary. I like the Lily of the Valley thank you cards. i know father's day is over but this is too cute! I really like the Vintage Patterned Stationary! Following Lily Jane on Twitter! "Liked" Lily Jane on Facebook! I would choose the flight pattern stationary set! It’s very pretty! I LOVE the Flight Pattern Stationery Set! The Flight Pattern Stationery Set is definitely my fave! Gorgeous! Nice items! I really like the Vintage Patterned Stationery set! you're the bees knees is my fave!! I absolutely love the Vintage Patterned Stationery - Set of 6. that is what I woudl choose. I love the Vintage Patterned Stationery. Purple is awesome. I like LIly Jane Stationary on facebook! Oh what a difficult choice! I love the flight pattern stationery, but it would also be wonderful to have some of the lovely rainbow birthday cards, a bee's knees card, and an e.e. cummings card. I like the Spring Seasonal Assorted Tag Set - they would be great for gift tags or as little thank you cards for my customers! I follow Lily on Twitter as dspdavey. Love the Rainbow Birthday Card ! The e.e. cummings Card is lovely! Wow they`re all so lovely! I think I would choose the vintage patterned stationary. Thank you. Lily of the Valley Thank You Cards - Set of 6. I like the Flight Pattern Stationery Set. If I won, I would choose... the Bee's Knees Cards. 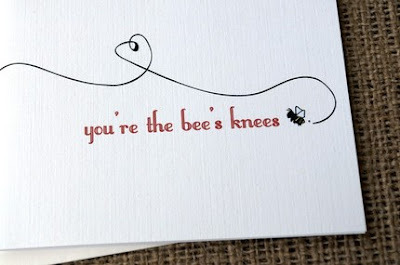 The Bee's Knees cards are too cute, my pic for sure! I would choose the Lily of the Valley Thank You Cards. There's always a reason to send a thank you to someone you love. i would choose the Vintage Patterned Stationery. I would choose the individual cards...I am in love with the e.e. Cummings Card! I follow Lily Jane on Twitter! I like Lily Jane on FB! I would choose The Bee's Knees Cards! I follow ljstationery on twitter, username slowclublover. I love the Lily of the Valley thank you set! so cute! I like the Vintage Patterned Stationary -Set of 6. I like the Vintage Patterned Stationery. I really like the Flight Pattern Stationery Set! I love the Thank You cards! Too cute! I love the e.e. cummings card, you're the bees knees card, cursive birthday card, rainbow birthday card, and the thank you from the bottom of my heart card!